Peggy, welcome to Fab Fantasy Fiction. First off, I just want to say I love your books! I'm a died-in-the -wool northerner, but know I must have southern roots somewhere (or just an aspiration for some). Whenever I need "my southern fix," I just dive into each of your stories to hear the voices, see the towns and cities, and meet the wonderful characters you create. I owe my joy in your work to a good friend who originally hails from Louisiana. She recommended your stories and said I couldn't have a better source for my "fix" than you! So, in your honor, I've prepared a pitcher of sweet tea. Might I get you anything else? I have some fresh chocolate drop cookies or some lemon squares, too. Thanks for having me, Emsy. And tell your friend thanks for spreading the word! Pass those lemon squares and let’s chat! (EVW) Peggy, you recently shared the most recent book, ELVIS AND THE BRIDEGROOM STIFFS, from your Southern Cousins Mysteries with me. I love Callie, Jack, and, of course, Elvis (and the titles!). Could you tell us a bit about this series? (PW) Thank you! I created the Southern Cousins Mysteries in 2008 and have been spinning Elvis capers ever since. Originally, Elvis was meant to be a ghost, but my chocolate Lab Jefferson had other ideas. When he left his place under my desk to do a little “Shake, Rattle and Roll” with his dog tags, I knew my doggie sleuth had to be the King of Rock ‘n’ Roll reincarnated. (EVW) The first thing that caught my eye was the great cover. Could you share a bit about how that came to be? (PW) The first five covers came from my publisher, but after I changed to Indie pub for Elvis and the Bridegroom Stiffs, I enlisted the help of my very talented, very beautiful granddaughter. (A completely objective opinion, you understand!) Cecilia is a freshman at SMU in Texas, and I couldn’t be happier with her artwork for my indie Elvis books! She also did that darling cover on Jack Loves Callie Tender, the prequel and companion guide to my Southern Cousins Mystery series. Though each mystery will stand on its own, the companion guide is a great way to catch up on all the books. (EVW) Do you have an actual Elvis at home who modeled for your character? Because I'd love to borrow him! Seriously, have any four-legged friends adopted you? 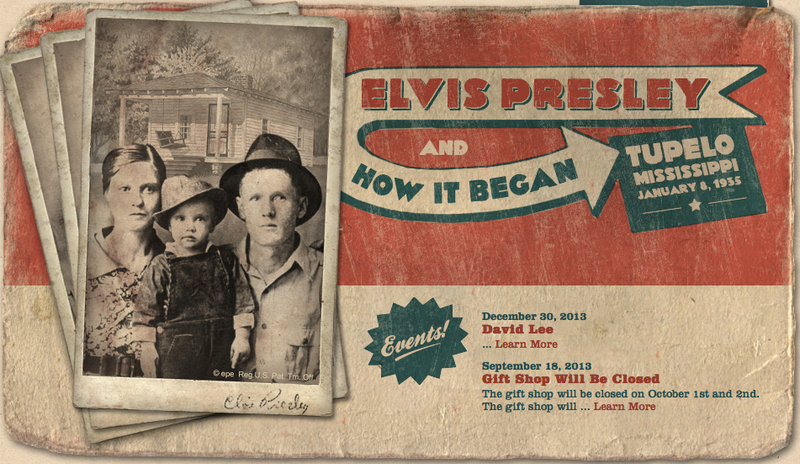 (PW) Hehehe…I live in the King’s birthplace, so it was very easy to catch Elvis fever and use all the wonderful anecdotes floating around Tupelo. In order for my doggie sleuth to get the facts straight, I also do extensive research into the many books written about the King. The big blooper in Elvis and the Blue Christmas Corpse was actually a typo that nobody caught. Elvis’ Comeback Special was in 1968, not ’58. I hope that sets the record straight! I have a huge poster on my office wall of Elvis in that incredible black leather jumpsuit with the date in plain sight. But back to my doggie models…My beautiful chocolate Labs, Jefferson and Sugar served as my first models. They are now at rest in a garden I created especially for them, but my two Lhasas take up the slack. They are so mischievous I can almost hear them in the corner plotting! (EVW) Not only do you write these fun and romantic cozy mysteries, but you also have some wonderful contemporary romances too. I got such a kick out of the Dixie Virgin Chronicles, the seven friends and their search for love, and your take on a Southern Carrie Bradshaw and her posse, but with one big difference - they're all virgins. How did you come up with this idea? Was it as much fun to write as to read? (PW) My muse follows me around without saying a word while I’m stewing and fretting over a plot line. When I crawl into bed and close my eyes, she trots out and shows off. After the idea for the Dixie Virgins came to me, I immediately called one of my best buds in the business, Debra Webb. We brainstormed and laughed our heads off at those sassy virgins. I drew on my own wonderful friendships for those emails. They were so much fun to create, I spent more time giggling than writing. (EVW) Many readers may or may not know that you also write under the name, Elaine Hussey and Anna Michaels. I'm so intrigued by the stories that have recently appeared under both these pen names: THE SWEETEST HALLELUJAH (Elaine Hussey) and THE TENDER MERCY OF ROSES (Anna Michaels). Could you tell us a bit about them? (PW) I am Southern to the bone and absolutely adore the fiction from the Mississippi literary greats such as Eudora Welty and William Faulkner. When I started my career in 1985, I always intended to write literary fiction. Somehow I got caught up in the merry-go-round of deadlines and romance conferences and book signings. Still, the complex stories that dig deep in the human mind and heart wouldn’t leave me alone. I am so blessed to have publishers Simon & Schuster for The Tender Mercy of Roses and MIRA for The Sweetest Hallelujah. Readers and reviewers have said such wonderful things about those novels I had to buy a new garden hat. My next literary novel, The Oleander Sisters, written as Elaine Hussey, comes out in August in trade paper, eBook and audio. My next literary novel from S&S is The Language of Silence. I don’t yet know the pub date, but the name will be changed from Anna Michaels to Peggy Webb. I’m happy about that. (EVW) Could you share a bit how your role as a writer as evolved over the years? Do you find that you're now having to be more proactive marketing yourself in social media? If so, is there a way that fans can support you? Do you have a Street Team? (PW) Oh, wow, Emsy. Thanks for that question! In the early days of my career, I simply wrote the books and did a few signings. Now, social media takes such a big chunk of my time, I stay in the office long hours so I can do what I love best – write! I do have Beta Readers but I need more. If anybody is interested, leave a message on FB or on my website at www.peggywebb.com. I should expand that to a Street Team, and perhaps I will this year. In the interim, it would be wonderful and very helpful if my fans would tweet and retweet and talk about my books on FB, Goodreads and any other social media you can think of. Oh, and please do write reviews! (EVW) Could you share what author(s) was your favorite growing up? What is on your bookshelf now? (PW) Growing up, I read everything the librarian recommended, including Little Women, National Velvet and every biography on the bookmobile. Today I get everything written by Pat Conroy, Joshilyn Jackson (LOVE gods in Alabama), Jodi Picoult, Pat Conroy, Alice Hoffman (ADORE Turtle Moon), Elizabeth Berg (Talk Before Sleep, marvelous). Currently I’m reading Sue Monk Kidd’s The Invention of Wings. I’m a book hound. I have them in bookshelves and baskets all over the house, not to mention my Ereader! Of course, I love the work by friends, Debra Webb, Vicki Hinze, Kathy Carmichael, Regan Black, v.R. Marks and Rita Herron! We’re teaming up for a collection of valentine short stories next month – My Evil Valentine. Elvis will be up to his short but handsome neck in trouble! Peggy, many thanks again for joining us today at Fab Fantasy Fiction. I know that there are going to be two very happy readers at the conclusion of the giveaway as you're offering digital copies of ELVIS AND THE BRIDEGROOM STIFFS. Do you have a question that you'd like to pose for them to answer in the comments below? Thank you, Emsy! I will be giving two digital copies of Elvis and the Bridegroom Stiffs since it is currently eBook only. Two lucky winners today! Oh my! You are so generous, Peggy. Thank you!!! Oh, here is the big question. What would love to chat about in my blog? This cozy has it all - chocolate, high heels, a bad boy on a Harley, and a cute dog (Elvis made me say that)! There are two winners for this giveaway as Peggy Webb is offering two lucky people digital copies of Southern Cousins Mystery Book 6: Elvis and the Bridegroom Stiffs! "What would love to chat about in my blog?" There hasn’t been a dead body around here since Corky Kelly knocked off Rudolph the Red-nosed Reindeer and tried to snuff out Santa Claus. What all this peace in the valley means is that a famous doggie sleuth like yours truly has plenty of time to make sure my human mom (that would Callie Valentine Jones, owner of the best little beauty shop in Mooreville) does not have a change of heart when my human daddy pops the question. I’ve got to work fast to get Jack and Callie back together and back to the altar. For keeps, this time. And speaking of weddings, everybody in Mooreville is up in arms over how Trixie Moffett dumped poor old Roy Jessup at the feed and seed store in favor of a slick dude who arouses suspicious minds. If you want to hear the real story, mosey on over to Gas, Grits and Guts. Fayrene always knows the lastest gossip. She’s got so many folks heading to her convenience store to hear news hot off wagging tongues, she’s had a big run on pickled pigs lips. Ruby Nell, Callie’s mama, called this morning to say she was heading that way, but it’s not gossip she’s after; it’s a little game of cards and some Prohibition punch with Fayrene in the séance room. When Ruby Nell’s not meddling in Callie’s love life, she’s with Fayrene looking for trouble. Another Valentine looking for trouble is Callie’s cousin, Lovie. Ever since she made up with Rocky Malone in that showdown in the séance room over at Gas, Grits and Guts, she’s been trying to get him to discover her National Treasure. He may look like God’s gift to every woman – a younger version of Harrison Ford on a dig without the white hat and the whip – but he’s the last of a dying breed, a gentleman who had rather woo and wed than woo and bed. As for yours truly, I’m through staying in Heartbreak Hotel over that two-timing French poodle, Ann Margret. If you’ll excuse me, I’m going to convince Callie’s silly spaniel there’s a steak buried on the other side of the fence. He’ll work his fool self silly digging a hole. And then I’m out of here, and it’s love machine time, baby! I hear there’s a hot new beagle babe hanging around Mooreville Truck Stop, and she’s not playing hard to get. Don’t tell Callie. I don’t like to worry my human mom. She’s got enough on her mind keeping Ruby Nell out of trouble and fixing hairdos for everybody who will be at Trixie Moffett’s wedding. That includes everybody who is anybody in Mooreville. 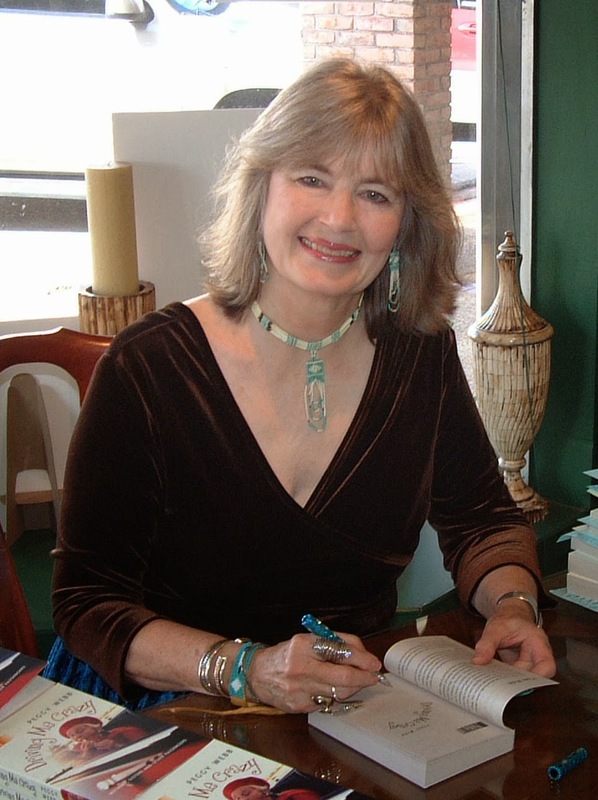 The Sweetest Hallelujah (MIRA, 2013), a literary fiction novel written under her pen name, Elaine Hussey, quickly became a reader favorite and received critical acclaim. From David Seaman: “To those who would say it’s blasphemy to place Harper Lee and Elaine Hussey in the same category, I say, read this book.” From J.K: “This one will blow your socks off.” From Book Lover: “I place this book up there with the great Southern novels.” Look for Elaine’s second book August 1, 2014: The Oleander Sisters. Peggy’s literary fiction novel The Tender Mercy of Roses (Simon and Schuster,2011), written as Anna Michaels was called “astonishing” by Pat Conroy. The Language of Silence is coming soon under Peggy’s own name. A former adjunct instructor at Mississippi State University, Peggy likes to describe herself as “Southern to the bone and a pillar of the church and community.” Her friends say she is as down-to-earth as the characters in her books and the roles she plays onstage at Tupelo Community Theater. She readily admits to being part Callie in the Southern Cousins Mystery series and part Maggie in her Pulitzer nominated novel Driving Me Crazy (2006). She even confesses she saw herself in her stage roles as M’Lynn in “Steel Magnolias” and The White Witch in “The Lion, The Witch, and The Wardrobe.” But she denies being the model for characters in Confessions of a Not So Dead Libido. “I am compelled to write,” she says. “My muse won’t let me remain idle.” Peggy’s body of work is a stunning testament to her muse: 71 novels, numerous blues songs, more than 200 magazine humor columns and two screenplays. In a career that spans nearly 30 years, this native Mississippian has seen millions of her books in print in more than 17 languages. Acclaimed by both fans and reviewers, Peggy’s novels consistently aapear on bestseller lists and garner awards. In 2009, Peggy received Romantic Times prestigious “Pioneer” award. Dubbed Queen of Comedy by her fans, Peggy forged the way for romantic comedy. She went back to her comedy roots with her mystery series. Her fans say, “To read a Peggy Webb novel is to howl with laughter.” Her classic romances are also big hits with her fans, especially the hilarious Duplicity, the groundbreaking A Prince for Jenny and the time-travel, Night of the Dragon. They say you can't get to Heaven without passing through the Eternal Rest Funeral Home. And no one gets into Eternal Rest without passing muster with Elvis--the basset hound who's convinced he's the reincarnation of the King of Rock 'n' Roll. Brewing up a big ol' pitcher of Mississippi mystery, Peggy Webb's delightful new series is as intoxicating as the Delta breeze. Normally, Callie Valentine Jones spends her days fixing up the hairdos of the dead, but when the corpse of local, prominent physician Dr. Leonard Laton goes missing, it's bad for business. So Callie and her cousin Lovie (Eternal Rest's resident wake caterer) have no choice but to go in hot pursuit of the recently embalmed, last seen bound for Vegas by way of downtown Tupelo. In Vegas, Callie and Lovie hit the jackpot when they find the dearly departed inside a freezer owned by his showgirl mistress, Bubble Malone. But their luck runs out when Bubble decides to join her man in the afterlife. With the poisonous Laton family tree providing plenty of rotten suspects, Callie, along with some help from her basset hound, Elvis, is determined to crack this case--and have a killer singing "Jailhouse Rock" in time for her next haircutting appointment. . .
Every year, a hip-shaking herd of Elvis impersonators descends upon the King's birthplace of Tupelo, Mississippi, for the annual Elvis festival. Usually the main attractions are lot of sequined jumpsuits and even more off-key singing, but this year something much more deadly has the town all shook up. . . When the first Elvis impersonator is found slumped over his piano, a heart attack seems the likely suspect. But when a second keels over mid-swagger at Callie Valentine Jones's party, suspicious minds begin to wonder if something foul is afoot. Because everyone knows two dead Elvis impersonators add up to only one thing: murder. As it turns out, Callie's cousin Lovie--a 190-pound bombshell who's had more lovers than the King had hit records--turns out to be suspect #1. Callie knows she's innocent but to prove it, she and Lovie will have to find out who the real killer is. Could it be Texas Elvis, who's sworn to out-swivel his rivals? Maybe the female Elvis from Australia, with the fake sideburns? Or one of the endlessly bickering officers of the fan club? It's a mystery fit for a King, and with a little help from Callie's hunk-a-burnin' love ex Jack, and her talented hound dog Elvis--who's convinced he's the true reincarnation of the King--Callie and Lovie are determined to have the killer singing Jailhouse Rock. But they need to move fast and be ready for the killer's next move, because their chance may be now. . .or never! Callie Valentine's mama Ruby Nell has gone and entered herself—and her hunk-a-geriatric-love dance partner—in a Memphis mambo contest, hoping to shake, rattle and roll her way to stardom. But someone at the competition is determined to step on a lot of blue suede shoes. First, a serial monogamist in a bright pink gown does a fatal swan dive from the top of the hotel. Then Callie finds an overdressed diva floating in a famous fountain. With help from Jack, the mysteriously reappearing ex Callie just can't get over, and her delusional dog Elvis, Callie and her cousin Lovie are going to have to track down some answers before mayhem strikes again. And with Ruby Nell in the killer's sights, they'll need a little less conversation and a lot more action if they want their family waltzing home in one piece. . .
Callie Valentine Jones can't think of a better way to check out of her personal Heartbreak Hotel then to accept her cousin Lovie's timely invite to get away in Cozumel, where her brainy beau is digging up bones for research. But the moment Callie and her loyal good luck charm Elvis arrive, trouble greets them in the form of a skeleton too fresh to be ancient history and too dead to spell anything but homicide. Suspicious minds blame ghosts and gods, but Callie knows the guilty party is all too human--and for once, she's determined not to get involved. That determination flies right out the window when Lovie and Elvis go missing. It's now or never, if Callie wants to save her cousin and her canine from someone who's got murder always on his mind. 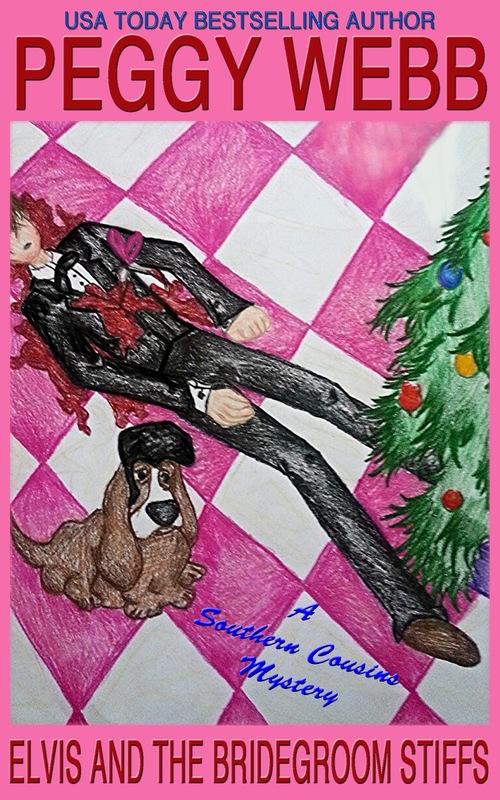 It may be Christmas in Tupelo, but Callie Valentine Jones' not-quite-ex Jack is trussed up like a holiday turkey recovering from a shattered leg, cousin Lovie's looking for love in all the wrong stockings, and Elvis the basset hound is out for revenge on a sneaky Lhasa Apso. Everyone finally gets into the spirit when Uncle Charlie is pressed into service as Santa at a weekend charity event in the mall. But Yuletide cheer turns to Yuletide fear after a killer tries to zap Charlie back to the North Pole marked "Return to Sender." Determined to find out who's decking the mall with Christmas corpses, Elvis and the Valentines fill up their sleigh with suspects as they attempt to unmask a devil in disguise in time to turn their "Blue Christmas" all Christmas-y and white.